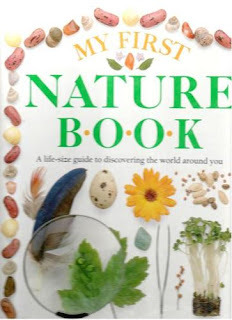 D (age 8), chose our Science Sunday project for the week, from the pages of Dorling Kindersley's My First Nature Book, A life-size guide to discovering the world around you. Earlier in the week he had emerged from his room, after our "nap time", carrying the book, with several of the projects marked, to show me (you've got to love a book, that can catch an eight year old's imagination for science). The first project he decided to try was the "Creepy Crawly Pit Traps", that involved digging a hole, or several holes, in the backyard, large enough to place a small, paper cup inside. ...to place an elevated cover onto (a piece of wood is suggested - we used old plastic lids). ...and discovered sugar ants prefer apples. ...and watched as they scampered quickly into the cover of the grass, or under fallen leaves. Beetles, apparently, really like string cheese though, because it was only a short while, after resetting the trap, that it was full of beetles again. ...his trap baited with a raspberry, remained empty. He reset it last night, with a piece of string cheese, curious to see if it would attract beetles in the garden too. Instead, he got slugs, much to his eight year old joy. Don't forget to check out this week's Science Sunday link-up, hosted by Adventures in Mommydom, for more science themed fun and ideas for children. What a great study! Now I am wondering if our garden has anyone who would be attracted by these traps. That is a very neat experiment! I never would have guessed that beetles liked cheese! That was an experiment I almost did last year with our flying creatures unit. I kept meaning to and meaning to and then it didn't happen. Maybe when it cools down a little. This is great, looks like fun! Selena would love this, she spent a good half hour a few days ago watching army ants working real hard to take food back to the nest.